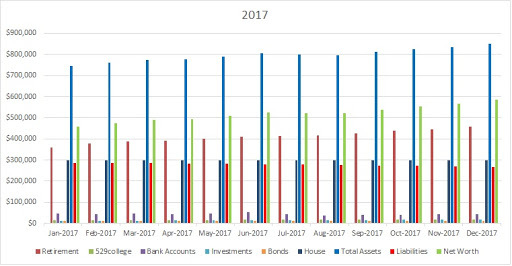 Here is a graphical representation of how our Assets, Liabilities and Net Worth changed throughout 2017. We are very cognizant of the fact that our assets have continued to grow not only because of what we put into the accounts but also, significantly, due to the historic stock market run we’re in the middle of. The markets will probably not continue at this pace for long. But hey, make hay while the sun shines! We also love the first few months of the year. Annual bonuses, yearly raises, 401(k) match from the employer – all come in the months of January to March. The next few posts should be fun! Looking forward to this year: M got a job offer, starting later this year. The new salary would be an increase of 48% over the current pay; with (guaranteed) bonuses, it’s a 60% jump. This change should provide a powerful push in our search for FIRE. With this development, we’re setting up new goals. Outstanding student loans today stands at tad under $19k. This WILL be wiped off by the end of the year, possibly by October. Our mortgage is currently at $226k. It’s more than just “hope” – we are paying around $800 extra towards principal each month. When the student loans are paid off, that will free up $1.4k a month which will then be directed towards the mortgage. When M starts the new job, we estimate that we’ll be able to pump in a total of $3k towards extra principal each month. Will this be hard? Almost certainly! If you ain’t sweating for it, you’re not doing it right. At that point (when we’re mortgage free) we’ll be that much closer to FIRE.